Front Binding – Ah, I love doing Limited Editions Club posts…especially when the books are mine! Removes the envy aspect of the equation. Anyway, this is an amazing book, I must say. 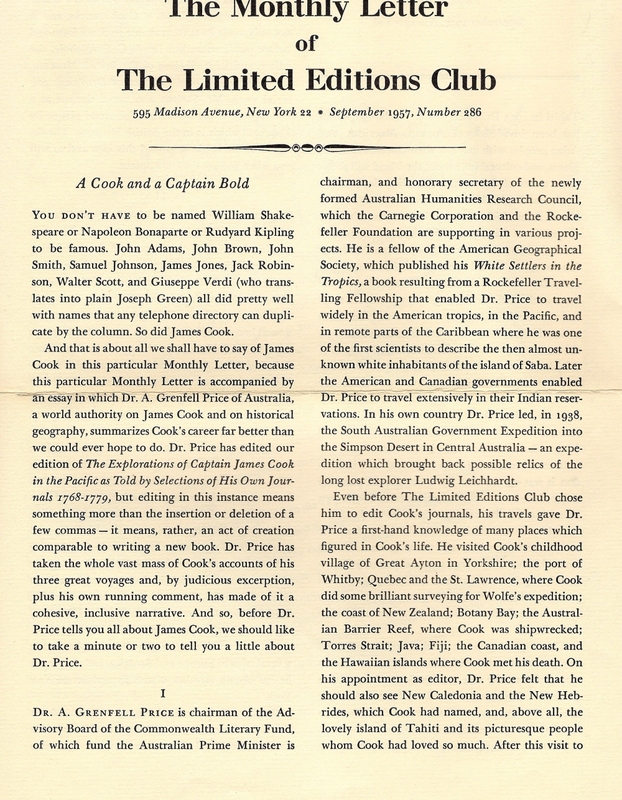 Issued in 1957, this is a collection of various journals, diaries and narratives from the voyages of Captain James Cook and his crew doing the years 1768-1779. 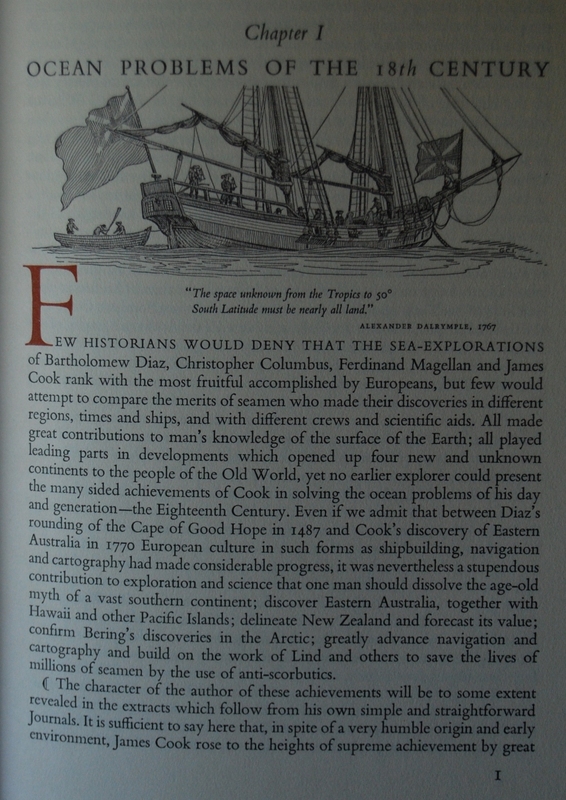 The material is a LEC-approved condensation of the greater work being done on the journals by the Hakluyt Society, which was prepping a four-volume set of Cook’s observations at the time this was published. However, let’s stop for a moment so I can tell you all about the binding. This is one of the coolest, most culturally-tied boards I’ve stumbled upon in the LEC oeuvre. 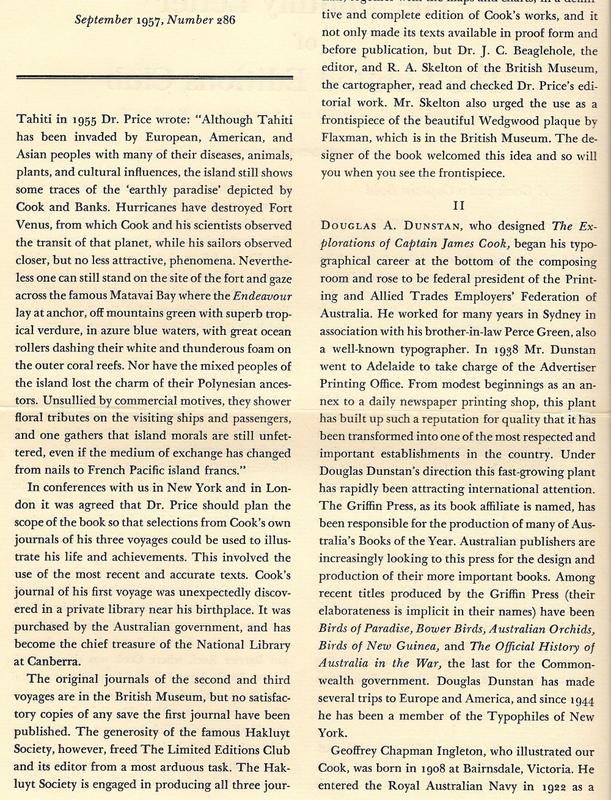 The book details the elaborate process on Page 295, which I will summarize for you. 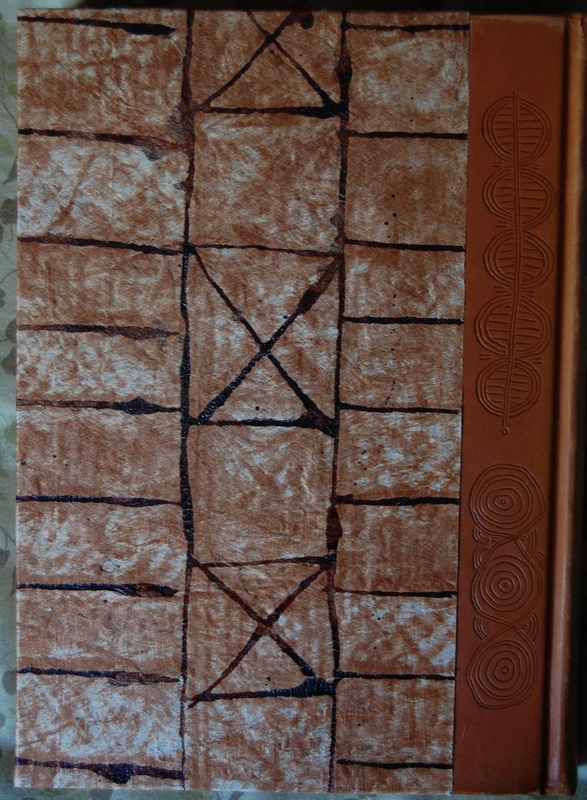 The cloth is called “tapa”; it is a very, VERY important component of the natives of Tonga. It was made by (at the time) contemporary women of those people for this edition, and it is a very long process to get it to look this nice. 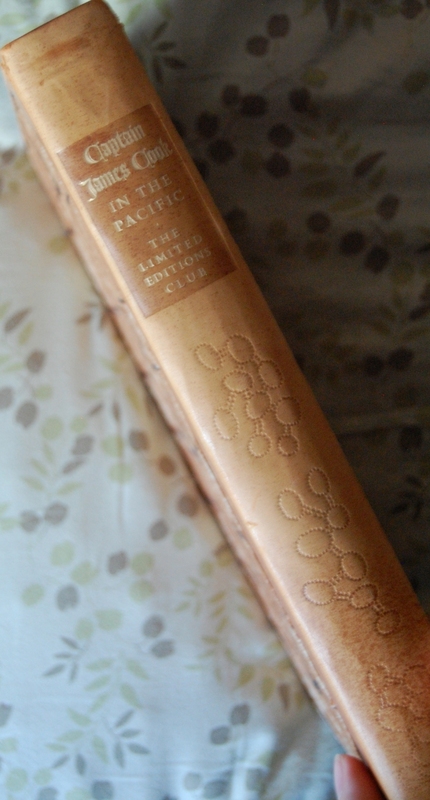 It comes from a specific plant only utilized for this purpose; the paper-mulberry tree (or “hiapo” to the Tonga) is the likely candidate for this book’s cloth. 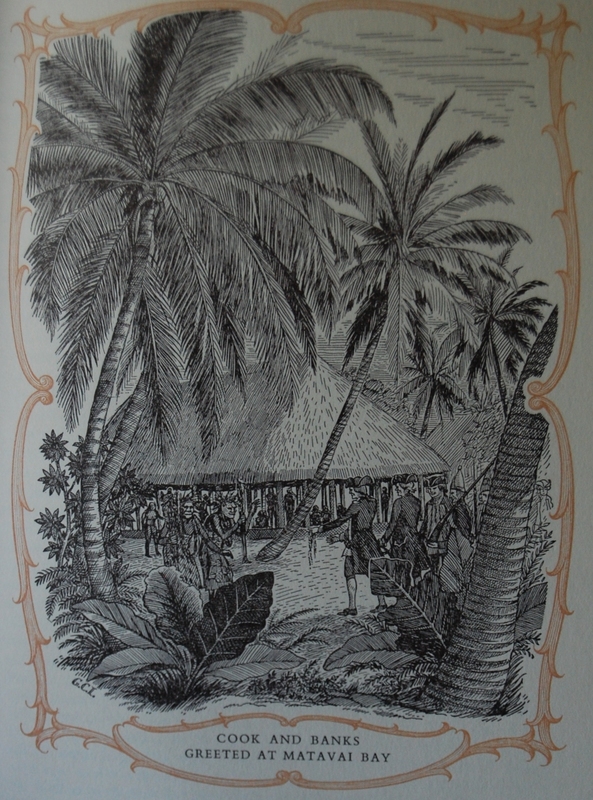 To the Tonga, the cloth is called “ngatu” and is often given out as gifts. 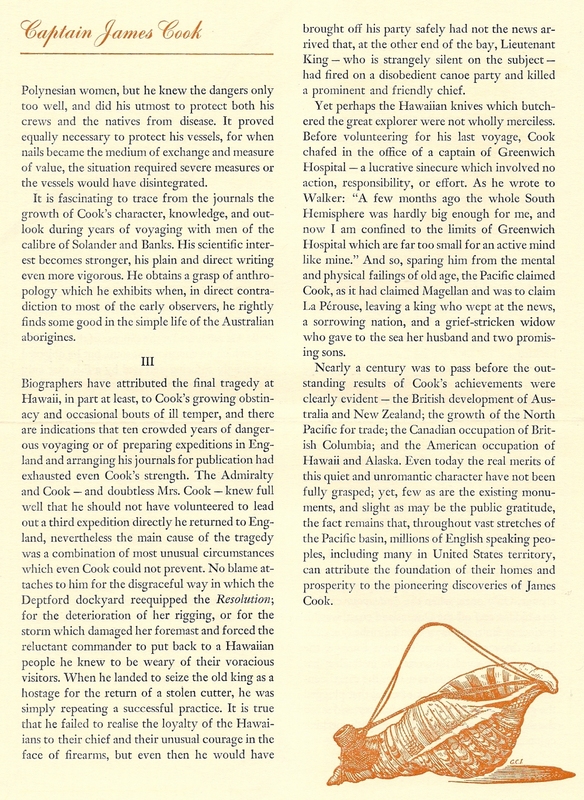 Right before the purchase of this book I had a class that explained the significance of this cloth to its native population, and found its use here for Cook’s journals (especially since he was the one who brought it to the world at large) incredibly apropos. More on the cloth can be seen here for those curious. 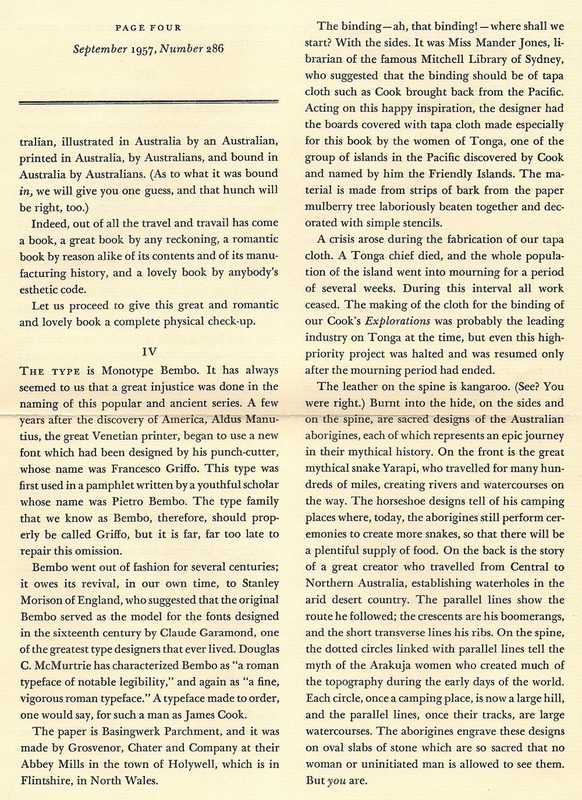 The spine leather is kangaroo, and features Australian Aborginal decorations that symbolizes key aspects about their culture. The front shows the mythic Yarapi, the snake who created many of the rivers and waterways during his travels. Each horseshoe-esque design shows where Yarapi rested, which are still used today as camping and ritual sites. I’ll explain the others when we get to them. 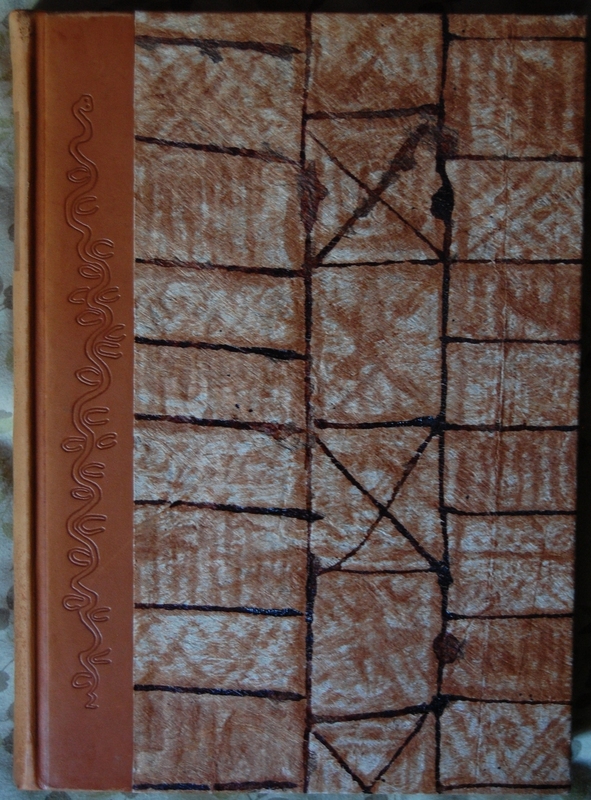 Back Binding – This side shows the the path of the creator of Australia, who planted waterholes over the deserts of Central to Northern Australia as he moved. The parallel lines reveal his route, and the boomerangs he carried are represented by the crescents. The short transverse lines represent his ribs. Awesome. Spine – Last but not least, the spine details the Arakuja’s mythology regarding women who formed the topography of the early world. Each circle served as a camping spot for the women, and is now a large hill, and the parallel lines, which were their path, now are waterways. The creation of all of these designs were originally engraved on oval stone slabs that are the epitome of sacredness to these people; women and uninitiated men are forbidden from seeing them. 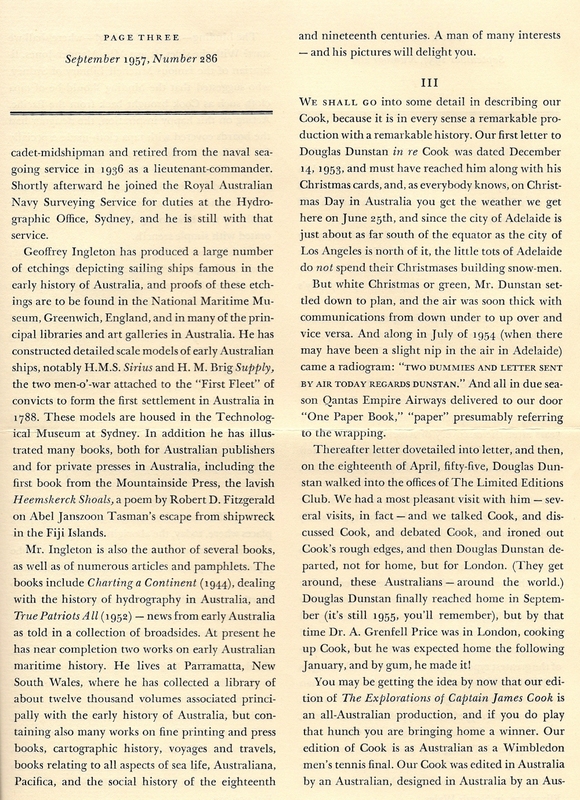 Like I said above, this book is a wondrous glimpse into the cultural roots of Australia and its neighboring islands. 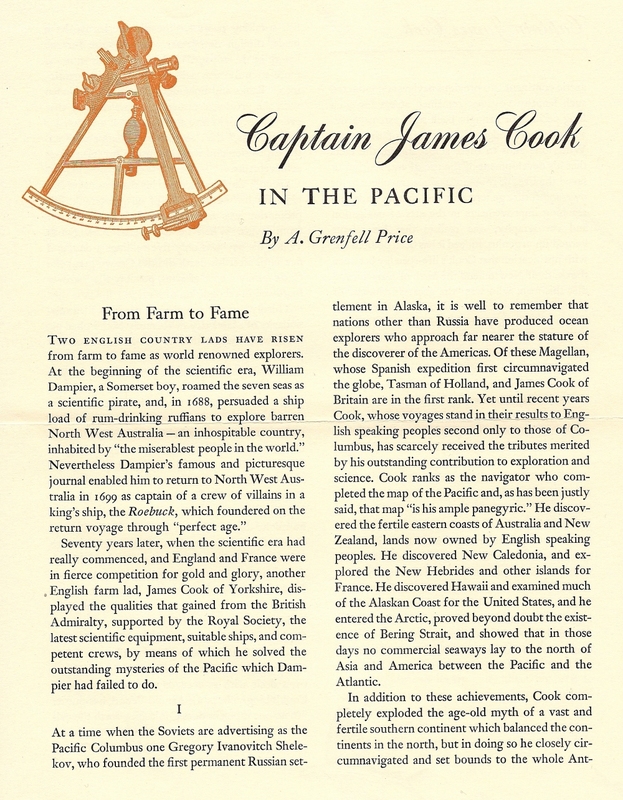 Title Page – A. Grenfell Price is your guide to Cook’s exploits, with further help from the Hakluyt Society. There is no formal introduction to the work; Price provides background and context before every section. 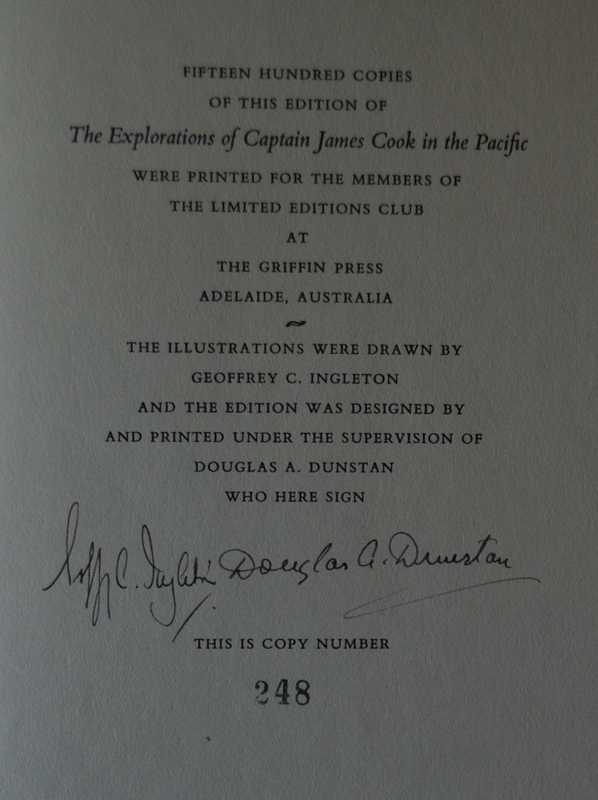 Signature Page – Ingleton and Dunstan both offer their penmanship here. My copy is #248 of 1500. 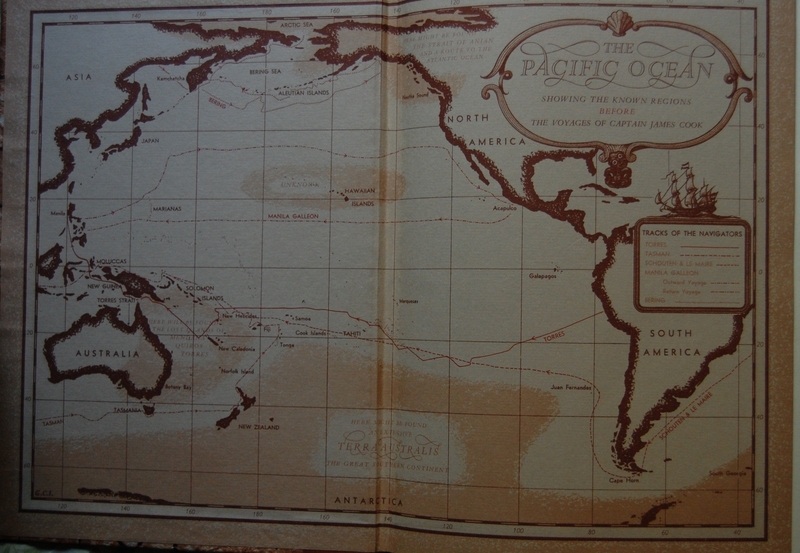 Front Endpapers – A nice map shows Cook’s route in comparison to prior sailors; the back endpapers reveal key voyages after Cook’s. 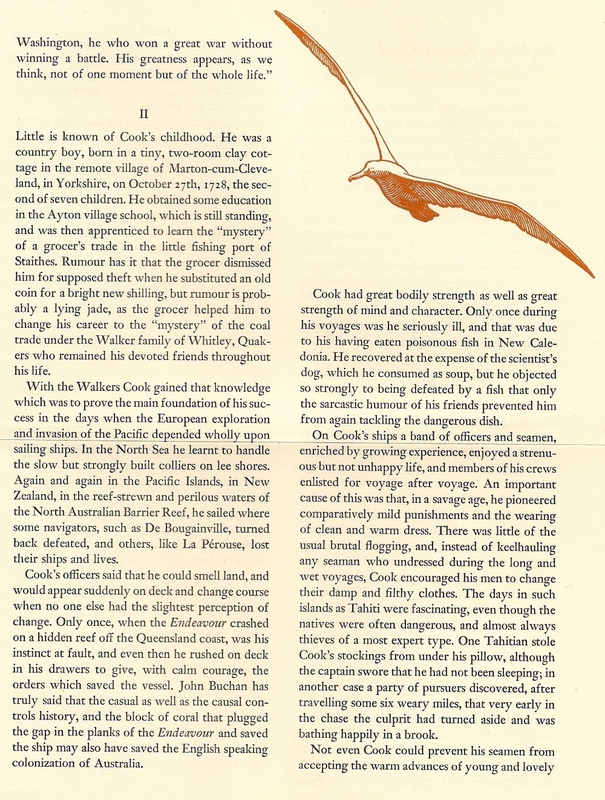 Page 1 – Ingleton has many smaller illustrations, including chapter headers like this. There’s also some tiny red-ink drawings in-text. 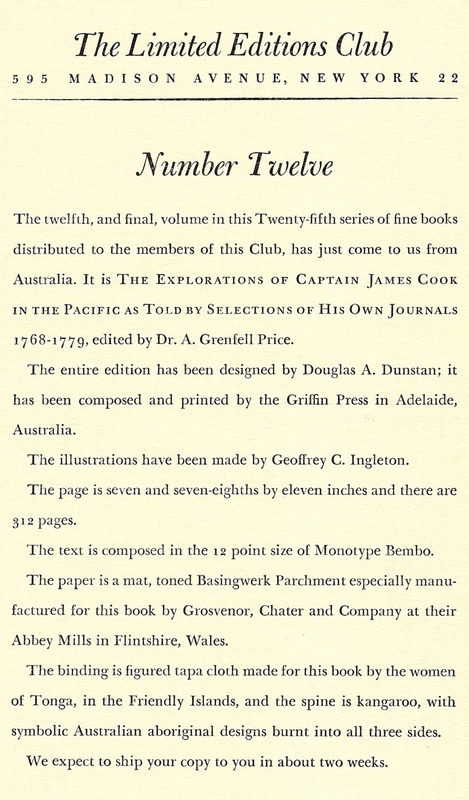 Page 27 – He also contributed a few full-page drawings. I like this work; it fits the motif, methinks. Personal Notes – This is LEC #21 for me, which I got for $100 in store credit at Carpe Diem Fine Books in Monterey. Nice shop, nice owners. This is a very special book, one I am happy to be its guardian. It does need to be demusked, though. Mine lacked the letter; thanks to the George Macy Devotees for their aid in furnishing one for this post! 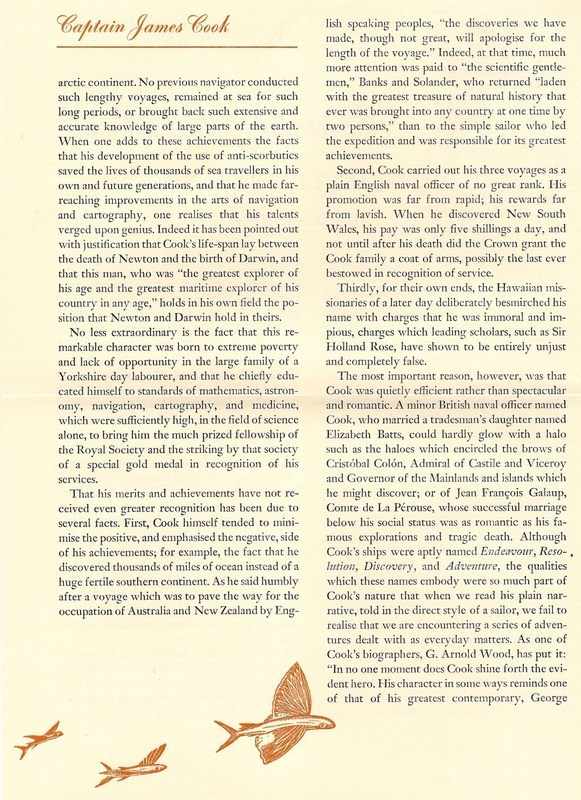 Speaking of letters, this one includes a four page essay by Price about Cook; see the final four pages for that. 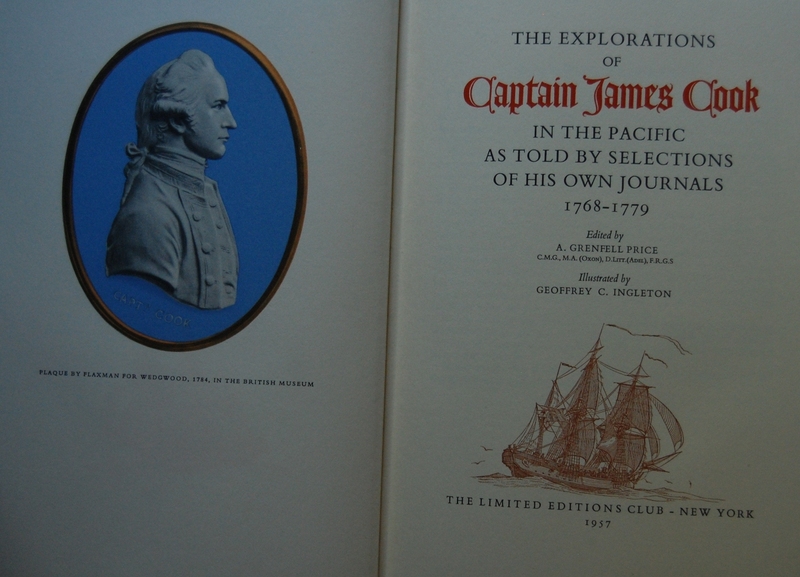 You are currently reading Limited Editions Club – The Explorations of Captain James Cook in the Pacific (1957) at The George Macy Imagery.